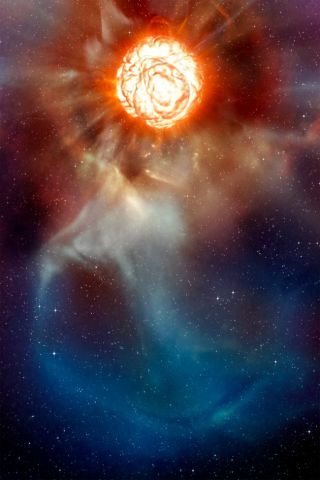 Chi Cygni, a red giant star as shown in this artist's conception, is nearing the end of its life. As it runs out of fuel, it pulses in and out, beating like a giant heart and ejecting shells of material. A preview of what's in store for our sun is in view acrossthe galaxy, as a similar star balloons in its dying throes. This sun twin, called Chi Cygni, liesabout 550 light-years away from Earth. As it nears the end of its life, it hasbloated in size and begun to pulse in and out like a giant beating heart. Theseare the telltale signs of a star running out of fuel after billions of yearsshining bright. New close-up photos of this star areoffering a sneak peak at our own sun'sdemise. The sun is now 4.6 billion years old. "This work opens a window ontothe fate of our sun five billion years from now, when it will near the end ofits life," said astronomer Sylvestre Lacour of the Observatoire de Paris. Chi Cygni is now in a phase of itslife called the red giant stage where it has inflated so much that, were it inour solar system, it would engulf every planet out to Mars. And indeed, the sunwill likely do just that one day when it is a redgiant. At that point, the Earth will most likely betoast. A particularly interesting featurecaptured by the new data is Chi Cygni's pulsations, which occur once every 408days. As the star begins to run out of hydrogen fuel for fusion burning in itscore, it cycles through stages of contracting and expanding, causing it tobrighten and dim in the sky. These pulsations allow it to jettison its outergaseous layers, which will eventually become a colorful planetary nebula. At its smallest, Chi Cygni's diameteris 300 million miles (483 million km). At this stage it is at its hottest, withgiant plumes of hot plasma churning on its surface. When it expands, the starcools and dims, reaching a maximum diameter of about 480 million miles (772million km). The new photos were captured with theSmithsonian Astrophysical Observatory's Infrared Optical Telescope Array(IOTA), at Whipple Observatory on Mount Hopkins, Ariz. This network ofinterconnected telescopes combines the light from several telescopes into oneimage, to yield a resolution equivalent to an observatory as large as thedistance between them. "IOTA offered uniquecapabilities," said researcher Marc Lacasse of the Harvard-SmithsonianCenter for Astrophysics. "It allowed us to see details in the images whichare about 15 times smaller than can be resolved in images from the Hubble SpaceTelescope." The team published their findings in arecent issue of The Astrophysical Journal.